I really hate saying hello or hi to being with. In really life I’m not really like that either I just start talking….usually. So have you ever gone surfing? I wanted to at one point when I lived in Florida growing up but it was more like a desire to just be able to do it without the effort. I’ve changed a lot since I was a child and my teenage years. I’m up for almost any challenge now. I still may try to make an excuse to not start something but unlike when I was younger- I don’t back out of a challenge I’ve already committed to. I guess I’m just not afraid of losing anymore. But yeah- I’d love to try surfing now! Sorry didn’t mean to get all deep on ya…XD cheesy I know. ON TO THE POLISH! So China Glaze Surfin’ For Boys has so far for me been one of the hardest to capture on my camera. 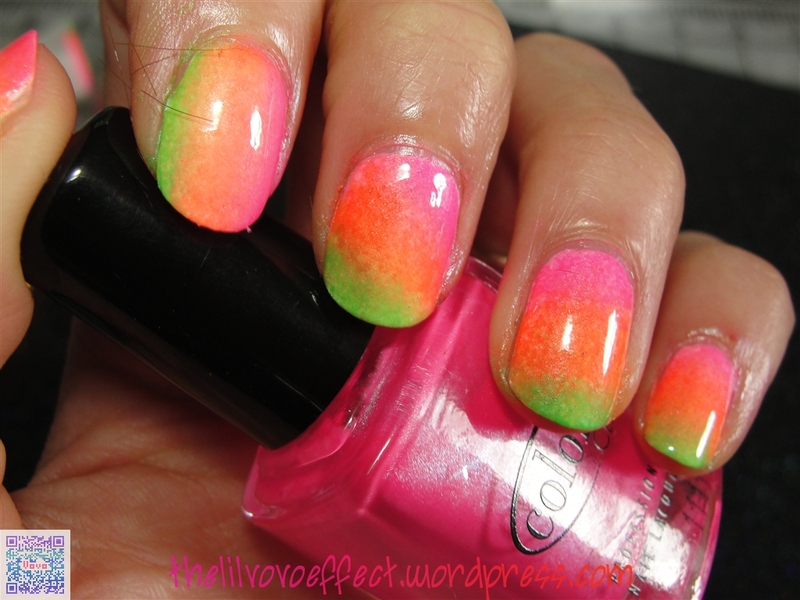 If you love neon corals with a pink shimmer maybe a tiny bit duo(colored? they’re not chromes! 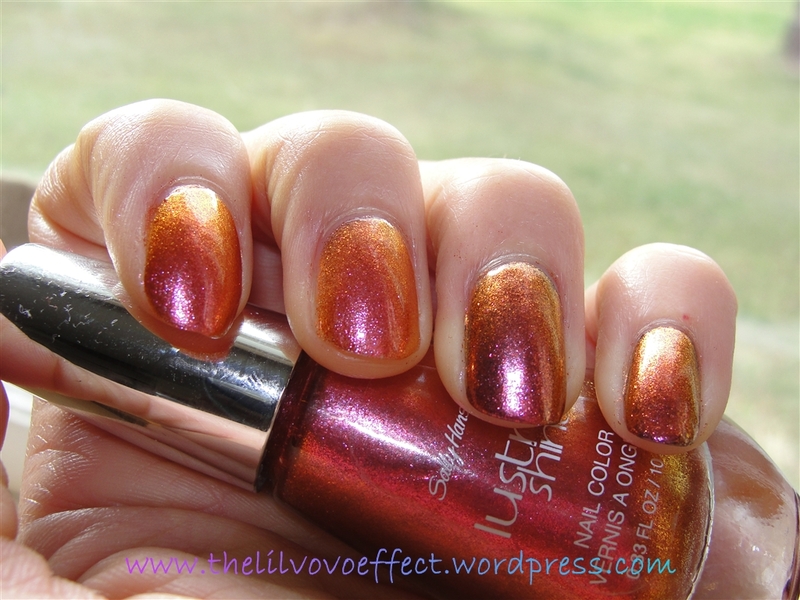 ), maybe its just a strong shimmer that I’m totally amazed at and at loss for proper description, you will LOVE THIS. It is a must see IRL. I highly recommend it. 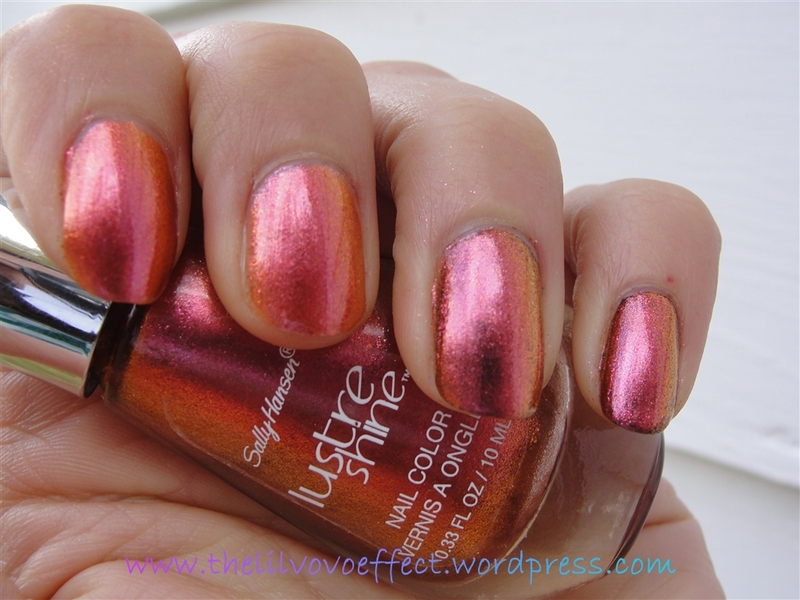 Good formula, 3 coats plus top coat, they dry satin matte because of their neon nature. The settings on my camera are altered so that the color was true but my flesh looked corpse like. Once I put the pics in the multiple image resizer to watermark and such, some how it made it seem a little bit more red toned then it is! 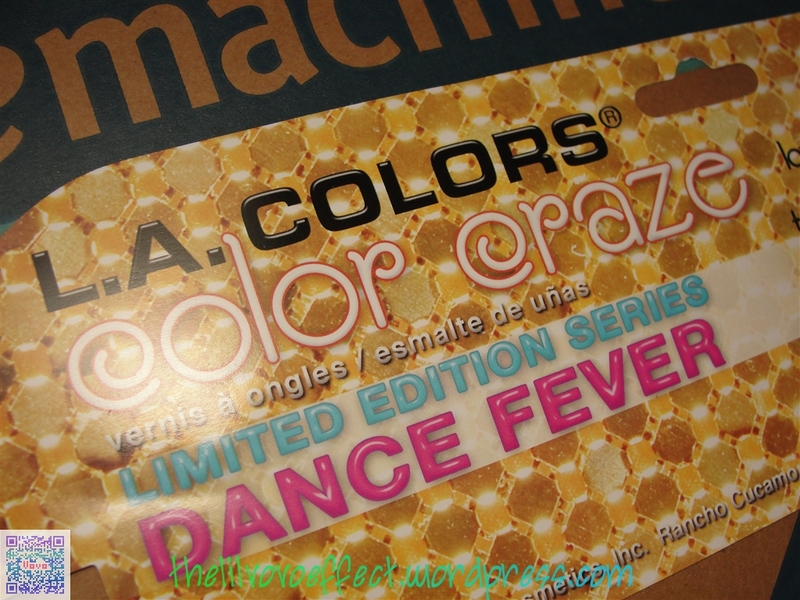 So what looks orangey should be a bit more pink so….neon coral as said before. So I could rave about this for awhile but I wont. Enjoy! Oh hi! So when Zoya came out with this years Beach & Surf summer collection my eyes nearly fell out of my head! I was a good girl and waited long enough for what I would call a really good coupon (3 for $15 and free ship). Seriously if you have a twitter account follow them, they totally clue you in when they have something like that going on. So here’s a pink I couldn’t resist. You may have noticed I’ve been doing a lot more pinks lately. I don’t know what it is but I’m totally being drawn to the girly color I once refused to wear haha. I love that Zoya Kimber (3 coats I think-no top coat) is not just any old creme finish berry “summer” pink. It’s not too purple toned and the gold shimmer in it is just divine! I little more the subtle IRL. 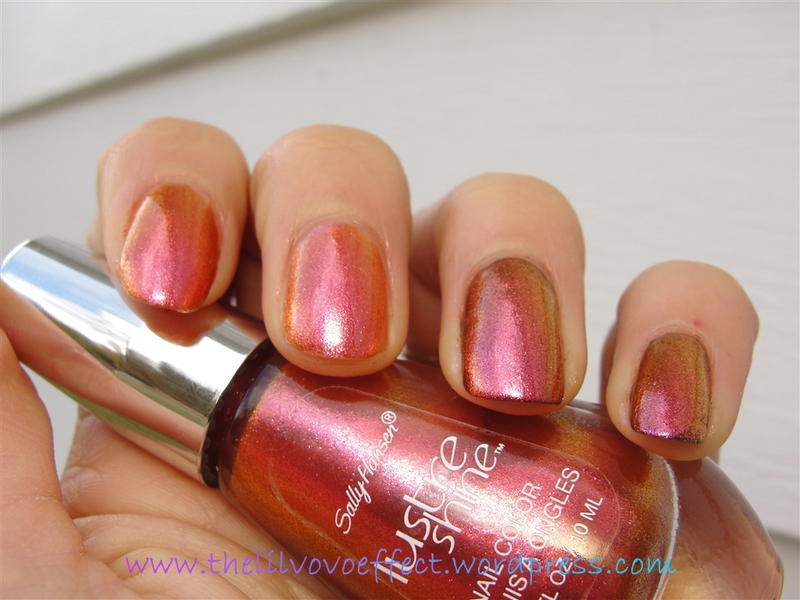 I’ve read on other blogs that people have quite a time getting the right top coat to work out with Zoya nail polish, apparently Seche Vite is an absolute no no combo with them. I find that making sure you coats are really dry in between layers and using Sally Hansen insta dri is just fine. I didn’t here but I have before without any problems. P.S. Sorry about the state of my cuticles in these pics the weather suddenly go hot and humid at that time and I was really dehydrated! Been drinking a lot more H20 so in a few weeks from now, things will start to look better. New Maybelline Color Show Nail Lacquers! June already?! I was wandering through Wally World the other day and stumbled upon a new and more then half empty display for Maybelline Color Show Nail Lacquers. I don’t own any Maybelline polishes so I grabbed 4 of these. I will say that it was hard to narrow it down to just 4- was was originally only going to get 2, haha. There were some awesome colors. Good thing I don’t own a credit card. Maybelline Crushed Candy in 3 coats with topcoat. Dry time on these are pretty good for someone like me I really take that into consideration because I have too much to do and I can’t sit around waiting. Formula was fantastic, great coverage this seems more like its a heavy shimmer packed jelly, you can see a visible nail line in this photo. I was quite happy with this as I was comparing this to Revlon Wild Strawberry and felt like the purple/blue shimmer that flashes in this was more then Revlons. 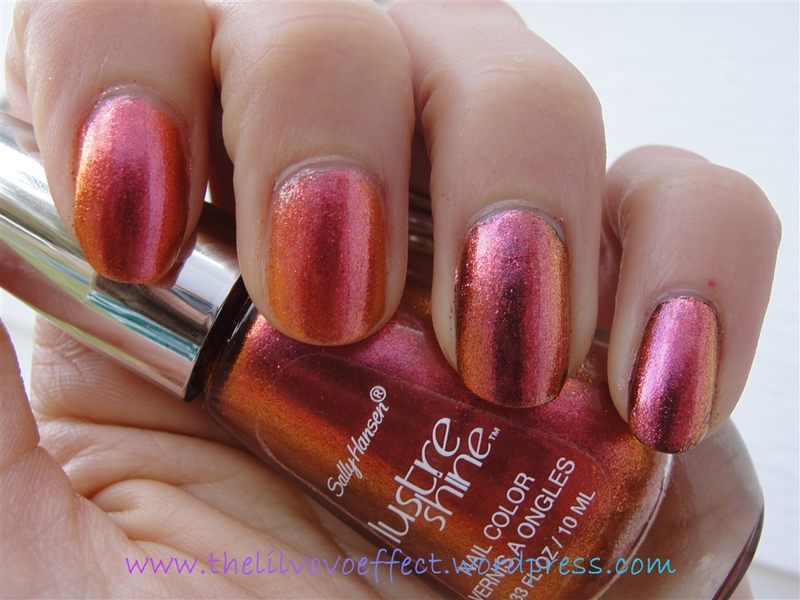 Amethyst Ablaze is ONE coat in this photo. This is labeled Metallics. Also it dries to a satin matte finish. You can also see any imperfection on the nail with this. 😛 Great formula great coverage. Next photo is with topcoat. Blue Freeze in 2 coats with topcoat. 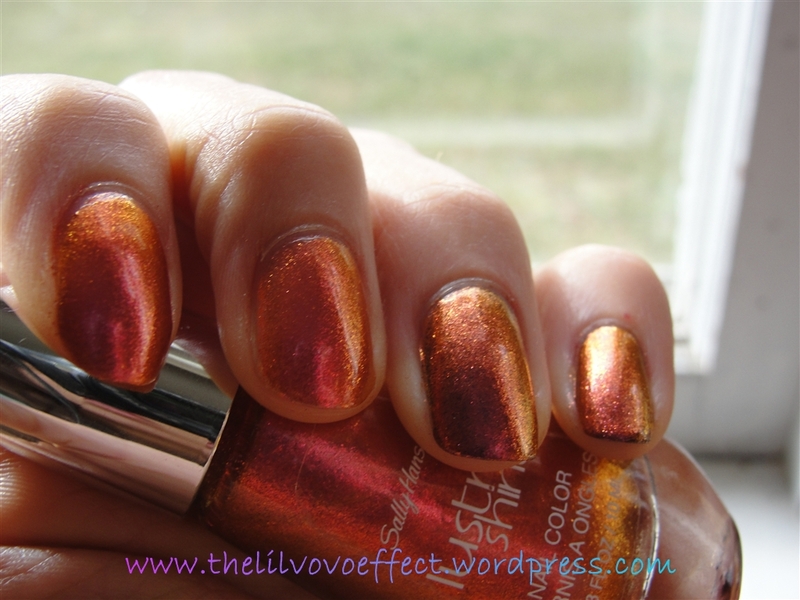 I picked this one up because in the bottle it has an amazing purple shimmer that flashes amazingly…in the bottle. IRL its not as prominent. But I’m not entirely disappointed because this is still very very pretty. Formula is great build beautifully. Maybe a tad runny but not awful. Twilight Rays is in 3 coats and topcoat. This black based polish is loaded with gold glass fleck shimmer. After I saw how Blue Freeze didn’t live up to what I thought was in the bottle I was worried this would look nearly as good as it represented itself on the shelf. As you can see it did not disappoint!!! I just loooove this! Great formula as it with the rest of these. So I’m not sure if our Walmart is always going to have these as the display is already taken down and the few bottles left were shoved onto a very random rack in the beauty department. I hope they do because these are great all around polishes and there were a few other colors I really wanted. Also if you check out Maybelline’s color wheel for these on their site- it is not accurate to what you see IN the bottle or ON the nail. They show #240 Twilight Rays as just #240 “Twilight” and a rather dark mossy green. So have any of you seen these elsewhere? Have you snatched up a few?